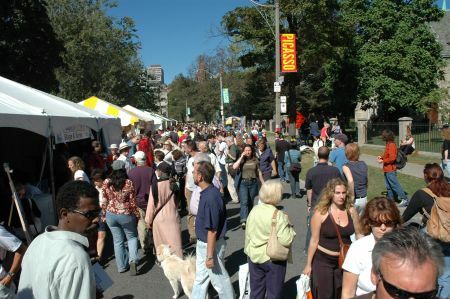 Toronto, Canada - Today (Sunday, September 26 - 2004) was the annual Word On The Street literary fair. Here writers of all kinds get together to display their talents and interact with other writers and the public. An estimated 200,000 spectators toured the park and it's 260 organizations promoting the written word. 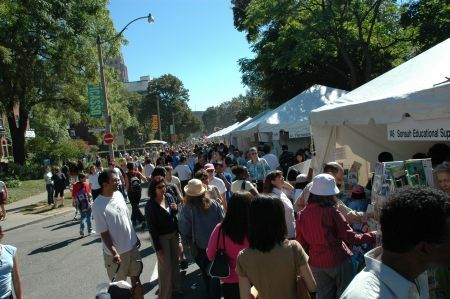 View of the fair along University Ave. in downtown Toronto. We arrived at noon with cameras in hand to archive this event and were amazed at the size of the venue. There were the large corporations that attended the event; but we went in search of the smaller, less noticed but true aficionados of the literary word - and we found them. Most of these participants were not located along the street area where most of the traffic was, but inside in the park itself. Participants who were located inside the park. Inside the park we saw an varied mix of participants promoting every sort of literary aspect imaginable. There was Al of the League Of Canadian Poets. This organization's mandate is to promote the awareness and Canadian poets in our society. Jason of the Canadian Music Centre; told us how his group manages a library of 16,000 works as they promote small time artists in our community. Roger, spokesman for the Canadian Writers Foundation explained how his organization helped destitute writers in our community and how more funds are necessary to keep the organization going ( http://www.canauthors.org/cwf ). 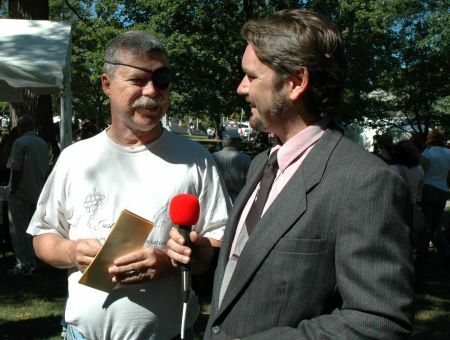 Roger of the Canadian Writer's Foundation with Dan on the right. On hand was also our own Mark Moore (aka pops_fire) with Zahava promoting both of their books. Mark was promoting his book chronicling several years of his fascinating life. 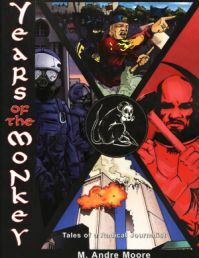 The book is called: Years Of The Monkey and is published by Rogue Planet, a publishing company started by Mark and Zahava. Zahava also has published a book (i.e. Rogue Planet) and it is a book of poems called: Naked Dreams. All of us at Fortress Of Freedom and I.A.I.J. congratulate Mark and Zahava on their accomplishments and wish nothing but the best for each of them as they enter the world of print media (If you are interested in contacting Mark or Zahava with regard to information or purchasing of their books; you can e-mail Mark at: mark@fortressoffreedom.com ). We also taped an interview with Mark that will air on our documentary early in 2005. Yet another view of the fair. 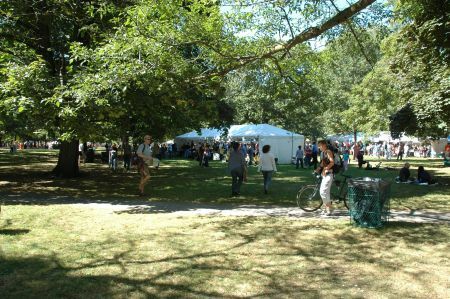 The Word On The Street literary fair promotes the literary world at the grass roots level. We at Fortress Of Freedom, endorse these types of initiatives as they in turn promote freedom of speech and expression. CLICK HERE TO VIEW THE VIDEO OF THE EVENT!